In Christina L. Schmidt’s debut novel for young adults, adolescent angst takes center stage as aspiring artist Lux Tazo and accomplished musician Ember Sweeney (leader of the eponymous band Falling Like Ember) fall in love on the first day of high school, but spend the next two years trying to thwart destiny. Lux has self-esteem issues and can’t accept that the most popular boy in school likes her; although attracted to him, she spurns his affections. Meanwhile, Ember has infinite patience and seems content to wait around for two years for Lux to change her mind. Then, just when it looks as if the two will get together at the beginning of their junior year, Lux falls out of her tree house and ends up in a coma. Convinced Lux will awake, Ember and Lux’s best friend, Anya, spend every day for the next two months at her bedside, while in her mind, Lux flies off to the fantasy land of Boreloque, replete with faeries, flying teddy bears and mythological demigods. Just when all seems lost, Ember and his band put on a “farewell” concert that changes everything. Music is at the heart of this novel. The characters constantly text one another with suggestions of artists, songs and playlists, and rather than offering mundane descriptions, Schmidt uses the references to reveal their motivations and emotions. Young readers immersed in popular music will enjoy this unique stylistic approach. 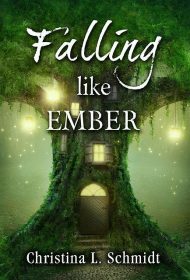 While the plot of young love lost and found again (and again) may seem hackneyed, Falling Like Ember definitely is not. Despite some silliness in the fantasy sections (i.e., the flying teddy bears seem overly childish) and the overuse of some trendy expressions (characters of all ages use “paramount” to indicate anything even remotely good), Schmidt has tapped into the real world of high school relationships and narrated the novel in a language her readers will understand—even crave. In doing so, she has transformed what might have been a trite story into something utterly fresh and original.